This year we have spent a lot of time convincing parents that children learn best through play. We have done various coffee meetings and met with parents individually and in small groups. The following write-up is what we posted on our notice board outside our Early Years Classroom to help inform parents and potential. As children play outdoors they are developing control over their bodies and movement. They are learning how their body parts interact and how to make one side do what the other side can do. Running, jumping, throwing a ball, sliding and riding a tricycle are fun ways children develop coordination of both large and small muscle skills. Outdoor play gives children opportunities to use whole arm movement and leg muscles. These activities are essential to physical development and help in the development of the small muscles needed for precise tasks. Reading, math and writing develop when children have control of their bodies and their muscles. Finally, outdoor play gives children an opportunity to work on social skills in a less restricted environment. In an outdoor setting children learn to share, take turns, express hurt feels, and work cooperatively. The Block Centre is a very versatile learning place. Reading, writing, math, language, and social skills occur through the use of blocks. When children plan and organise their structures they are learning beginning skills necessary for reading and writing. Children develop important thinking skills such as creating balance, order, and symmetry as they work with blocks. Blocks are in direct mathematical proportion so fractions, part/whole relationships, shapes, and counting are a natural part of building. When children work together to create a structure, they are sharing not only the blocks but their ideas and plans for the structure. Planning together gives them a reason to work cooperatively. The Construction Centre is a favourite place because all the activities are open-ended since the resources have no stopping point. By having open-ended materials, children can develop the ability of taking different approaches to solve problems they encounter when building. There are no “wrong” or “right” answers at this centre. 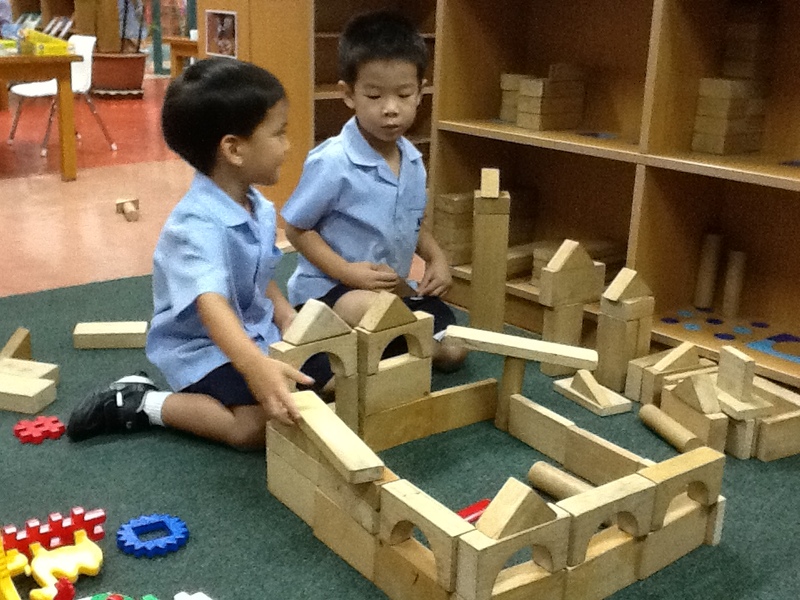 The children work with small blocks, various shapes and other similar manipulatives. When the children are creating a pattern, putting pieces together to form a whole, or measuring their construction they are using math skills. The purpose of the Construction Centre is not to have a “finished” product but to give children the opportunity to experiment, initiate, create, and solve problems. Children are naturally drawn to music and dance. As children sing songs or move to the beat of the music, they explore and practice important developmental skills. Singing helps children develop new vocabulary words, practice words they already know, create and imitate sounds, recognise and repeat patterns, and compare sounds to each other. Science skills are develop as children strike a triangle and discover cause and effect. They learn about pitch, volume, and sound waves. Large muscles are developed as children express the mood of what they hear with their body movements. Movement, music and children go hand-in-hand. As children play in the Dramatic Play Centre, they learn to take turns, share, and select their friends based on common interests. They take on family and community roles that help them understand what other people do and how they at. In essence children have an opportunity to try on a role to see if it fits their personality style. The Dramatic Play Centre helps them learn to make choices and decisions as they discover ways people help each other. Both math and reading skills are practiced as the children use a variety of objects like the phone books, recipe books, coupons and menus. Children learn to problem solve, work out difficult situations, develop vocabulary and practice social interaction in the Dramatic Play Centre. The sand and water centre is a place to learn many different concepts and skills. Children learn math by measuring volume, weight, balance and distance. In addition, they learn the concepts of more and less, empty and full, and solid and liquid. They develop find motor skills when they scoop, pour, drip, dump and mix. Children develop scientific principles when they explore different textures and experiment the the properties of many kinds of materials. Vocabulary is increased as children work with and talk about the funnels, water wheels, basters, and pipettes. As they move wet sand they “excavate” and when they make a channel for the water to move through they construct a “canal” and sometimes they make a dam to stop the water from moving. The Manipulatives Centre has many different areas such as magnet boards, puzzles and games. There are many choices so that children have many opportunities to select an activity of interest to them. At this centre your child works with a puzzle with a friend or learns to share cooperatively by playing a game. Finding the different pieces of a puzzle helps your children learn about similarities and differences or figure ground perceptions (distinguishing shapes from their background). Puzzle work also helps develop the understanding of the part/whole relationship, a valuable math and reading skills. By working with a friend there are lots of opportunities to negotiate and problem solve which leads to the development of effective communication skills. The Art Centre is an exciting place for children to work. It draws them like a magnet. When children work in the Art Centre they are learning more than how to paint. They are learning reading, writing and math. Reading occurs when children see the differences in their brush strokes and learn to duplicate different strokes or shapes. Recognition of likenesses and differences are basic skills necessary when learning to write and do math. When children use thin and thick brushes or paint thin and thick lines they are learning math. Math skills also evolve when children select and paint on paper of different shapes. When children try to title their painting or put their names on the paper they are practicing writing skills. Skills that are the foundation of writing such as learning about spacing things on paper, working from the top to the bottom, and painting from the left to the right develop when a child is in the Art Centre. Creativity blossoms when children are painting. There are many ways to put the paint on the paper and many ways to express ideas and thoughts. Expressing creativity leads to building problem solving skills.